The occurrence of a disease at more than an endemic level may stimulate an investigation during which investigators may ask three questions. Who was attacked by the disease? The answers to this question will help to identify those characteristics of the human host that are closely related to disease risk. When did the disease occur? Some diseases occur with a certain periodicity. This question is also addressed by examining trends of disease incidence over time. Where did the cases rise? The answers to the previous questions lead to determining the how and why of an outbreak. Disease is not randomly distributed in time and place. These questions are central to virtually all outbreak investigations. 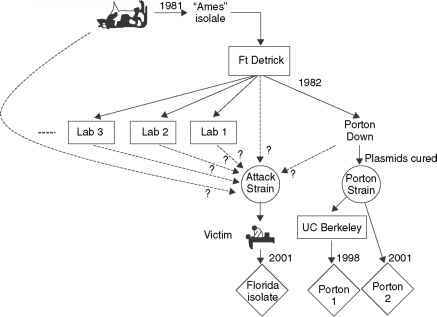 The investigation of an outbreak may be primarily deductive (i.e., reasoning from premises or propositions proved antecedently) or inductive (i.e., reasoning from particular facts to a general conclusion), or it may be a combination of both. Important considerations in the investigation of acute outbreaks of infectious disease include: (1) determining that an outbreak has in fact occurred, (2) defining the population at risk, (3) determining the method of spread and reservoir, and (4) characterizing the agent. The steps commonly used for investigating an outbreak are shown in Table 8.2.